One of the most intriguing questions about modern comics for collectors to ponder is newsstand versus direct edition rarity. Beginning in 1979 (or 1977 if you count Whitman/Western non-returnable comics), Marvel sold two distinguishable versions of their comics across two distinct distribution channels, one where comics were direct-sold to specialty comic shops on a discounted but non-returnable basis, and another where comics were distributed to newsstands and unsold copies could be returned for a refund. Collectors can distinguish returnable copies from non-returnable ones in the same way the publisher did: by looking at what is in the UPC code box area (if this is something you were unaware of, you may want to read Comic Book Newsstand Editions: Understanding The Difference). Had they done this, we could then look up any given issue we’re curious about and actually see the count of how many CGC has graded of each type, understanding of course that the CGC census data for any given issue is a small sampling of the total outstanding copies that were sold — it is only going to reflect the subset of total copies out there that collectors have turned in for grading… but that still would have provided an extremely useful input and it is a shame that the data is forever lost and lumped together. Because much like TV ratings and election polling is done with a small sampling of the total audience/voters, CGC census data can be very revealing, especially for those issues where collectors have turned in a thousand+ copies giving us a fairly large sample size. But alas, CGC’s policy has been to lump together newsstand and direct edition comics by issue number… except in certain special situations. In this post I will talk about these special situations, including two new special situations I only became aware of this year on account of The Doc Collection (if you’re wondering “what is The Doc Collection” — I will discuss that as well, including a very interesting Q&A with its seller). The population of Canada in 1982 (and throughout the variant window) represented 9.8% of the population of North America. One such special situation that I’d been aware of for a long time (and have written a lot about) has been the window of time in the 1980’s that newsstand copies of comic books that were produced for Canada — but importantly: printed simultaneously with the other copies by the same publisher and on the same equipment here in the USA — were printed with a higher cover price (for more information see 75 Cent Variants: Canadian Newsstand Editions and read the comment section as well where a reader revealed that the distribution was imperfect and some of the variants were in fact sold right here in the USA in border states — if collector peers right here in the USA bought them in their own home towns, that is arguably all the more reason that these variants are “fair game” for the rest of us too!). Before the variant cover price window, the prices were the same across all of North America (typically 60 cents per issue) and therefore all of the North American market got the same exact newsstand copies; and after the window, we find that the newsstand batches were “merged” and both the US and Canadian prices were shown on all newsstand copies (and so all of North America once again got the same identical newsstand copies). But during the window two distinct batches of newsstand copies were produced, one for each price. Canada was a small 9.8% fraction of the North American market for comic books by population size during that time (most people don’t think about how despite Canada’s giant geographic footprint it actually has a tiny population relative to the USA, similar in size to that of California alone, for example). And the higher cover price variants were a newsstand-only phenomenon (because all of the direct edition copies during that window were the same and had both prices on them). So these particular CGC-recognized newsstand variants were only sold to a portion of that already-tiny Canadian market. Spawn Batman is one example of a newsstand issue that CGC “breaks out” as a distinct variant, noting on the label that the cover is paper stock, and that there is a UPC code on the back cover (which direct edition copies lack). For U.S. newsstand comics, one of the special situations where CGC will “break out” newsstand comics as variants is in the case of manufacturing differences (such as different paper quality), which was a common phenomenon among newsstand comics produced by Image Comics. Not all Image newsstand comics had this phenomenon (for example Spawn newsstand comics only began to be printed with newsprint pages instead of glossy around issue #8 — I say “around” because there are no “Newsstand Edition” variants of issue #7 or earlier showing up on census at the time of this writing and I haven’t personally verified the paper used for issues after #3 myself, so it could be the case that newsprint was indeed used before #8 but that nobody has sent one in yet). And so while they did succeed in attaining some newsstand distribution, they sold the vast majority of their comics as direct editions, to comic shops — and some of the manufacturing choices they elected for the newsstand copies may have been done in order to save money to help them compete (using cheap newsprint instead of expensive glossy paper for example; as another example for Spawn Batman the direct edition cover was thick card stock while the newsstand edition cover was regular paper). 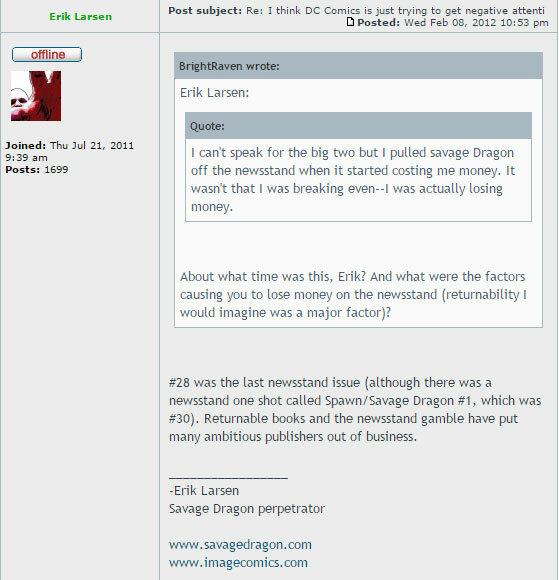 Some of Image’s titles did better than others on the newsstand, for example sales of the more popular Spawn title fared better than Savage Dragon — Erik Larsen has posted about that title’s struggles on the newsstand, saying that he completely pulled Savage Dragon off of the newsstands by 1996 because it was losing money. Because of this special situation as a new entrant, Image’s experience as a publisher on the newsstands in the 90’s would certainly be a much different one as compared to Marvel or D.C. — but it is widely discussed out there that newsstand sales even for those heavyweights were in major decline and I’ll go into that more, later in this post. Aside from manufacturing differences like the Image examples above, in the last year I became aware of two other special situations where CGC has decided to “break out” U.S. newsstand comics. What caused me to become aware of these other special cases was The Doc Collection. Read on: I will next explain these other two “special situations” and also what The Doc Collection is, as well as present an interesting Q&A with the seller who has been liquidating that collection on behalf of its owner (which is posted with their permission). The “typical” comic book collector in the modern era purchased their collectibles from a specialty comics shop. To buy comics on newsstands was to buy comics that had been manhandled by the staff (who treated them just like the magazines beside them — publications meant to be read — with no reason to preserve condition). And that was assuming the comic sought was even there on the stands in the first place, given how unreliable newsstand distribution could be. By shopping for their collectibles in a comics shop, the typical collector was able to reliably take home a pristine-condition copy and do so without missing an issue. The comics shop I frequented in the 1990’s as a kid had a special program for regular customers like me, where a mint condition copy of the next issue for any title you wanted to collect was bagged, boarded, and set aside with your name on it, ensuring not a single collectible was missed. One of these is the “direct edition” version, the other is the “newsstand” version… Can you tell which is which? To the untrained eye they look the same, but they are in fact different, not just having a different UPC code but the cover prices are $1 apart! But by focusing on condition and reliability, that typical collector (like me back then) may not have realized that they took home a “direct edition” copy… Even today, not all collectors realize that there was another version out there other than the one they themselves took home. The Overstreet price guide doesn’t distinguish the types, giving no “cue” in the guide to prompt anyone to think about the difference when looking up values… And the difference is practically invisible as we move to “late modern” comics where both newsstand and direct edition copies have UPC codes (albeit different ones), making them look identical to the untrained eye. But this UPC code difference, while it may look like trivia “at a glance” it is far from trivial — indeed, what’s in that code box can cause the newsstand version to be a CGC-recognized variant. “The Doc” was not your typical collector. Nicknamed “The Doc” by the friend (hirivercomics) who has been auctioning off his collection on eBay one comic at a time, this collector was a doctor, living in the mountains of North Georgia. And The Doc, being a Doc, had an interesting connection… he knew the owner of his local drugstore. And through that connection, had an advantage that the typical collector did not: The Doc could cherry pick newsstand comics before they were handled by the staff, before they ever touched the rack in the drugstore. The Doc Collection is, simply put, the largest known late modern newsstand collection, and most certainly the largest pristine-condition late modern newsstand collection. And quite possibly a one-of-a-kind collection in that sense. And because the pristine condition is so abnormal among newsstand comics, submissions of comics from this collection are responsible for at least one, and possibly both, of the other two “special situations” where CGC has elected to “break out” US newsstand copies as distinct census variants. The typical newsstand comic book out there would just not be in “CGC-worthy” condition, compared to a typical direct edition copy… but the Doc’s comics are CGC-worthy. In this way, prompting submissions and causing CGC to consider new situations they hadn’t encountered before where breaking out newsstand comics as variants was warranted, the Doc Collection has already changed comic book history, by giving us a whole new “class” of CGC-recognized variants where CGC’s census data will separately track newsstand copies as distinct from their direct edition counterparts! X-Men Origins: Deadpool #1, Newsstand Variant, published 9/2010 by Marvel Comics, but with the UPC code for “Incredible Hulk”. This is one of the other types of “special situations” that I noticed for the first time specifically because of the Doc Collection, that I hadn’t known about before. It turns out that Marvel did not always print a given newsstand comic with the “right” UPC code. In fact, they did not always create a distinct UPC code at all (especially for one-shots it seems). In many cases, instead of creating a whole new code, newsstand copies of this era were instead given a “borrowed” UPC code, i.e., borrowed from another title. Whether we consider this an “error” (arguably it isn’t erroneous if the publisher did it on purpose as they appear to have done), or just an interesting phenomenon, the result is that CGC breaks these newsstand comics out as variants. So this is hardly just a bit of “trivia” because it is giving us a group of Marvel newsstand comics where we can actually see the copy count accumulate over time on census, allowing us to be able to compare the count of newsstand and direct edition copies of these issues. The name applied to these types of newsstand comics on the census lookup and on the CGC labels is “Newsstand Variant.” I first noticed these on census when looking up Amazing Spider-Man #600, #606, and #607 — although the variant name for newsstand copies of these three was later changed (this year) which I’ll get to in a bit. For those three examples plus a lot of other copies of Amazing Spider-Man during this time-frame, it turns out Marvel used codes other than the Amazing Spider-Man UPC code. (See more about this interesting phenomenon about UPC code “cycling” in the ASM title in my separate post about Amazing Spider-Man / Friendly Neighborhood Spider-Man / Sensational Spider-Man code cycling). $3.99 Newsstand Edition CGC variant label. Amazing Spider-Man #615, $3.99 Newsstand Edition. Although the UPC code identifies this comic as a different title (Friendly Neighborhood Spider-Man), so CGC could also have chosen to go with “Newsstand Variant”, the cover price at $3.99 is a dollar higher than direct edition copies, and CGC broke it out as a “$3.99 Newsstand Edition” variant. And here’s a close-up on the UPC box where you can see that this issue is priced at $3.99, not the normal $2.99. Here’s the one “special situation” category that I know for certain CGC only considered this year (2016), specifically because of the submission of Doc Collection newsstand comics. There is an entire publication “window” during which newsstand comics were priced $1 higher than their direct edition counter-parts (which had cover prices of $2.99). If you’re thinking this reminds you very much of 35 cent variants then you’ve had the same thought as me: it might very well be the case that Marvel was testing a price increase for a period of time by measuring newsstand sales (because this cover price variant “window” was followed by the direct edition regular pricing broadly catching up to $3.99). Whatever the reason for the existence of this cover price variant window, my applause goes to CGC for making the great decision to “break out” newsstand comics from this cover price variant window as distinct census variants! Since newsstand copies of ASM #600, 606, and 607 are cover price variants (in addition to having that “incorrect” UPC code phenomenon), CGC ultimately changed the name for those — possibly for the sake of consistency across the title — so you may find older graded copies out there that say Newsstand Variant, or, you may find newer ones that say $3.99 Newsstand Edition. Amazing Spider-Man #607 census lookup as of this writing, where you can see the $3.99 Newsstand Edition broken out as a variant. It will be very interesting to watch the census numbers accumulate over the course of time for these and other $3.99 Newsstand Edition comics; this “era” of newsstand publication was very close to the point in time where Marvel ended sales to most newsstand outlets — I’ll talk about that further a little later. So for the census data to differentiate the newsstand comics from their direct edition counterparts during this cover price variant window is going to be exceptionally interesting as the data fills out over the fullness of time. Q) I feel very fortunate to have picked off some of the Doc’s comics at auction, especially some Amazing Spider-Man books in incredible shape. But there are notable “holes” in the Doc’s ASM run, which seem to correspond to the UPC code that was used on them. At some point, Marvel started “cycling” the codes on these, alternating between “Amazing Spider-Man”, “Friendly Neighborhood Spider-Man”, and “Sensational Spider-Man”. It seems every third comic was missed by the Doc? A) I was puzzled by Doc’s Amazing run when I first saw it — after they started putting Amazing and Friendly on the UPC code every third issue was missing! I found out later about the missed ones that they had Sensational Spider-Man on them!!! Q) For the missed Amazing Spider-Man issue numbers with the Sensational code on them, do you know if this missed distribution was specific to certain types of stores, or certain regions? A) I found some out there with the Sensational code and the seller/sellers were all from the Northeast (NY,etc)! During the time Doc was getting his, I can tell you that there wasn’t anybody in the Atlanta area with newsstand comics anymore! Q) What about the Doc’s area? A) The drugstore was the only store in the entire North Ga area to receive news stand comics! Like I said this would most likely mean that from south of Atlanta to maybe even the Fla border to the northern Ga borders there was only the one store receiving these!! I’m sure that the far northeast of the country (where bigger cities with a more walking population were) was still getting more news stand copies! Q) It is really fascinating that they cycled the ASM codes, and they only sent two out of every three ASM’s to the drugstore based on those codes. Were there other titles that his store simply wasn’t sent? A) They didn’t get a large variety of titles — No Flash, Wonder Woman, Action, Ghost Rider!!! Since the store owner wasn’t concerned with titles and was the only client for the distributor, there wasn’t any rhyme or reason to the ordering!! Q) Is there any way to estimate how many newsstand copies of a given title or issue made it out there to the public? A) No one can actually find out how many of an issue were printed if any. A Holy Grail is Daredevil Vol 2 # 15 – rumor has it that there was a news stand version, but no one I know has ever seen it! Also Amazing Spider-Man Vol 2 # 559 and Annual # 37! I only know of one guy that has a 559. I was offered $1,500 for the three if I could find them!!! Q) I’ve noticed some Doc listings where there’s a sticker over the UPC code, like the Wolverine #47 listing, I’m curious if you can tell what’s behind that sticker, i.e. is this maybe a case where there wasn’t a distinct print run of newsstand copies for that issue number and the distributor is using copies from the direct edition print run and covering up the UPC code with a sticker to get the right code onto it? A) According to what I’ve been told when there was a mistake like with price instead of reprinting them, a sticker was placed on the comic! Along with the 47 I’ve found JLA 118 and Superman 677 had stickers also!! Even crazier is that there’s two different stickers for the Sup 677–I only have one of them!! Q) Are you able to reveal the total size of the Doc’s newsstand collection and how many you’ve already sold? A) The Doc collection originally had around 50,000 comics–it’s down to around 6 or 8,000 now!! When collecting a given comic book issue, its value may go up as collectors grow to prize that issue more highly over time — maybe for example because that issue contains a key first appearance of a character that gets more popular, or because the issue is particularly important to the story-line in some way, or is an important work for a given artist or writer, or other such typical reasons. But whatever the reason a particular issue’s value may rise in the future, that’s just one way to win: i.e. you made a good choice about which issue to collect. The way I see it, all of the examples of “special situation” newsstand comics I’ve discussed here — Canadian Editions (higher cover price), Newsstand Editions (manufacturing differences), Newsstand Variants (UPC code “errors”/borrowing), and $3.99 Newsstand Editions (cover price variance) — are clearly going to be proven out over the fullness of time as more rare than their “regular” counterparts. And incredibly, collector awareness of these variants is so low, that at the present time it is possible to win these variants at auction for regular prices or very close. If you’re able to pay little to no premium for the more rare version, that gives you a second way to win. Collectors of Iron Fist #14 or Star Wars #1 or any number of comic books during the 35 cent variant window of 1977 could have placed 30 cent copies or 35 cent copies into their collections when targeting any given issue they were looking to collect… and until 1998 very little attention was paid to the difference. But fast-forward to today, and clearly, collectors who targeted the 35 cent copies have been more richly rewarded… because they had two ways to win instead of one. Not only did the issue itself climb in value, but the rarity premium grew (or “exploded” may be the better word — look where the Star Wars variants are valued today!). Two sales of ASM #606 from earlier this year: the one at the top is the $3.99 newsstand edition, while the one at the bottom is a regular prevalent direct edition copy. Similarly, $3.99 newsstand edition copies of ASM #607 can recently be found for prices in-line with regular prevalent direct edition copies. The same phenomenon can in fact be found among examples from all of the different “special situation” categories I’ve talked about in this post. But one cannot rely on a “refined” eBay search with “newsstand” in it to find them, so there is extra effort involved in reviewing all the new listings and doing your own visual screen for newsstand copies, but with that extra effort and a lot of patience I’m certain you can find these newsstand bargains out there, giving you similar cost basis to the going rate for their direct edition counterparts. And if you can get in at a similar cost, then you will have those two ways to win: the issue number may climb in value, and the relative rarity may command a premium in the distant future, the same way 35 cent variants were initially overlooked but command such a premium all these years later. But Shooter would lose this support-the-newsstand battle, and direct edition sales would grow to that point he had feared where ultimately they were entirely dependent on the direct market, and eventually Marvel would shut down the newsstand channel entirely (very interesting quote from David Gabriel on this subject I’ll share in just a minute). A great comics research resource, Comichron, estimated industry-wide 2013 newsstand comic book sales of only $25 million versus comic store orders (direct edition) of $340 million — add those two numbers together and we reach a total of $365 million. Divide $25 million into that total, and that would put the estimated newsstand percentage at 6.8% for 2013, versus direct edition at 93.2%. Although we must take his estimates with the proper grain of salt since his exercise of “breaking out” the two versions may have allowed survivorship difference to creep into his numbers (newsstand comics seeing a much higher typical destruction rate than direct edition), and while furthermore we must be cognizant of the fact he is selling newsstand comic books on his website, it is also the case that few other people out there would have this kind of internal database to draw information from: i.e. having performed this incredible undertaking of breaking out that enormous inventory, he can look at his database and see the count of newsstand copies versus direct edition copies he’s accumulated after buying so many comic book collections and accumulating so many back issues. He can presumably see the comparative counts by issue number, title, publisher, and year. Doesn’t that make you a little bit jealous, that hobbyists like you and me do not have access to that same wealth of information? But one thing to conclude from all of this is fairly clear to this collector and perhaps you will agree: regardless of precisely how relatively rare newsstand comics are to their direct edition counter-parts, they are definitely more rare by some very large margin especially in those later years: and that margin gives us a second way to win. When collecting any given late modern comic, I therefore prefer to collect the newsstand version, especially out of those “special situation” categories where we get CGC-recognized variants that I talked about here and especially when I can pay little to no premium to do so! I’m really enjoying your blog about the joys of collecting newsstand comics. I remember collecting Marvel newsstand comics in preference to its “diamond” comics, back in the day (the diamonds were just so ugly–and just like the Whitman bagged comics that were so despised by collectors at that time). Eventually, I gave up the fight and started collecting direct-sales copies. I wish I’d never done that now. I think you’re on to something here, and I’ve resumed picking up newsstand comics preferentially to direct-sales comics. In response to your comment above that paper differences between newsstand and direct-sales comics might be an Image-specific phenomenon, let me assure you that they aren’t. Bearing in mind that, in Image’s early days, the Image partners wrote and drew comics, and (IIRC) outsourced printing and distribution concerns to Malibu, it might be slightly more accurate (if incomplete) to say that it was a Malibu phenomenon. Malibu continued the practice with its Ultraverse line from 1993-95. There was a good discussion of this at comiccollectorlive.com about a year ago, in the “Newsstand editions” subforum of its “Comic Book Talk” forum. DC followed suit in the 1997-99 time period, for some of its lower-priced titles. This was also discussed at the location cited above. Keep up the interesting discussion! Hi David, thanks so much for reading and commenting! I greatly appreciate your sharing that insight into the D.C. newsstand comics with manufacturing differences, I will definitely have to dig into those! By contrast looking for the direct edition version of some of these is simply “shopping” — where plenty of NM direct edition choices are out there, so landing one is just a matter of picking a listing and buying it. Not so with the newsstand versions of some of these, where for the more rare ones it can be months between a copy coming up for sale. That’s the kind of collecting that brings me joy… all because it is hard to find these. Mike here–owner of Hi River Comics!!! Amazing research!! I’ve been selling the Doc collection for almost 3 years!! Learned so much from the buyers!! The rarity of these comics is crazy!!! Some of these we’ve sold have gotten hundreds of times over guide if they were direct sale editions!!! As far as general collector-appreciation of newsstand comics, one thing that maintaining this blog gives me is some very interesting WordPress Stats data — including data about which keyword searches collectors are entering into search engines before they land on my blog. In other words, if someone goes to a search engine, enters, say, “$3.99 Newsstand Edition Comics” as their search string, and then clicks to my blog from there (assuming of course one of my pages comes up in the list of search results), then oftentimes WordPress is able to reveal that search string information to me on my Stats page. And what I see there continually coming up on that Stats page week after week reinforces to me the fact that newsstand awareness is most certainly growing among collectors, much like a snowball rolling down a mountainside — that snowball is now rolling fast sitting here in 2017, with so much speed that there’s certainly no stopping it now, and the only question left is how much further it has to roll before it reaches its final destination. But it is crystal clear to me that huge numbers of collectors are out there are actively researching the difference between direct edition and newsstand comics — which means that every day, every week, every month, more and more people who previously didn’t know fact #1 about the difference between direct edition and newsstand comics, will come to know the difference through their research. The more people who are informed, the more we’ll see sellers recognize when theirs is a newsstand comic and then list it for sale with the “newsstand” keyword in the title and a higher price tag than they’d have otherwise demanded, to reflect the rarity. And an increase in such “newsstand-aware listings” will then, in turn, cause more uninformed people to perform research — someone who doesn’t yet realize there is a newsstand vs. direct edition difference, upon seeing such listings, will have a natural curiosity… maybe they’ll then turn to search engines with that curiosity… and then join the snowball of informed collectors when they learn the answer. – Ben p.s. As far as market value difference, about halfway down that post I explore a couple of keys where the newsstand values have already pulled away pretty clearly, with top graded newsstand copies fetching a very noticeable premium over their prevalent direct edition counterparts. I could swear somewhere on this site I saw at least one issue of Amazing Spiderman that had 3 different newsstand prices. For some reason, direct $1.99, ns $1.99, ns $2.29 and ns $2.49 sticks in my head. I can’t seem to find it going through all the articles. Can someone point me in the right direction, or am I delusional? Thanks. Hi Philip, it was either Amazing Spider-Man v2 #13, 11, or 10 that you saw (or all of those); direct editions for each of those issues carry a cover price of $1.99 US / $2.99 CAN, but there are three different documented newsstand versions with different cover prices (that we know of to date). [I’ve yet to observe this phenomenon with #12 but if anyone has, please chime in; I do notice that direct edition #12’s carry a higher cover price of $2.99 US / $4.50 CAN].